Since the introduction in 2009, the BoosterPlug fuel injection optimization device has been an instant success with motorcycle owners around the world. 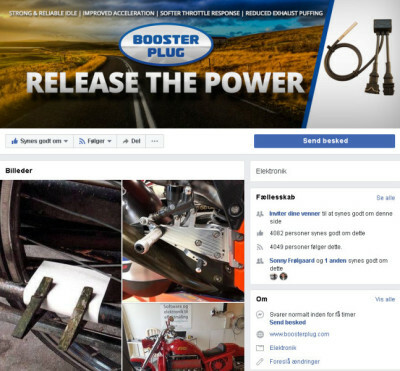 The BoosterPlug is a simple device to solve the common low speed running issues that haunts all modern fuel injected motorcycles – without the need for expensive setup and programming sessions at the workshop. You just click it in using the original connectors, and you are ready to go. All modern motorcycles are running on a much too lean air/fuel ratio because they must meet the regulations that are actually made for the engine in the family car. The car engine can cope with the lean mixture because of its big and heavy flywheel that makes the engine run well at low speeds. The Motorcycle engine have virtually no flywheel weight, and the result of the lean air/fuel mixture is a weak idle where the engine easily stall on takeoff, poor low speed behavior with a hard and unpleasant throttle action that makes it difficult to operate the motorcycle in a smooth and safe way. So the lean mixture on the modern fuel injected motorcycle means that we will have to ride in a lower gear than necessary through town to get the engine speed up (Increased noise and pollution), and that the motorcycle is potentially dangerous because it is not easy and smooth to ride. The BoosterPlug will provide the small controlled fuel enrichment that is necessary to solve the low speed running problems, but will not affect fuel consumption when the motorcycle is going at a steady speed on the open roads. Like Tourstart, the BoosterPlug was developed because an experienced motorcycle rider (and entrepreneur) saw the need for a solution and decided to do something about it. The BoosterPlug was never intended to become a commercial product and a world wide success, and the first prototypes was actually build because the inventor of the BoosterPlug needed a solution for his own bike. Here is the story in his own words. ”I have a background in industrial electronics and have been building motorcycle fuel injection systems from scratch for many years. In 2008 I got a brand new BMW, and I obviously expected the fuel injection to perform a lot better than the early and rather crude systems. But it had the same low speed issues and the bike was running like a pig, so I had to sort it out. With 4 computers on the bike and CAN-BUS communication is would be a massive project to build another new fuel injection system, and I just wanted the bike to run properly. I started looking into alternative solutions, and after a lot of different tests and prototypes, I came up with the device we know as the BoosterPlug today. It solved the fueling problems so well and was really easy to install, and I thought that other owners could be interested in it. So I build a few handful of them, but the word was spreading really fast and they was ripped away, and I could never make enough units to meet demand. The only solution was to outsource the production to a Danish specialist in industrial electronics production as they was the only supplier that could meet my quality demands, and it allowed me to focus on developing the BoosterPlug for new motorcycle models. Going fast forward to 2018, the BoosterPlug Company is now a well-established player in the market covering more than 550 different Motorcycle models, and more than 30.000 BoosterPlug modules have been shipped to customers in 80 different countries. An amazing success story and a very different picture compared to the humble start back in 2009. Jens Lyck has been writing a book about motorcycle injection, which can be downloaded by clicking on the book below.